Thermalinc: Bung Entering Drum Heaters! Bung entering immersion drum heater has "Cold rise" design for maximum efficiency. Thermal cut-out prevents low liquid level overheating. Connected to 240 VAC, unit produces 4000 watts, which is ideal for use with less viscous fluids, as it will raise 250 lbs. (30 gal.) of water to 50°F in about one hour. 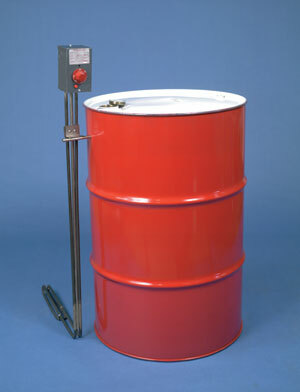 With the unit connected to 120 VAC, 1000 watts will be generated for products such as oils and high viscosity liquids. Stainless Steel sheath for caustic, and water-based products. Calibrated thermostat 60°-250°F. Or Steel Sheath For Oils and oil based products. Please call for details. Note: Cord and plug not included. Must be wired according to the local electrical code.